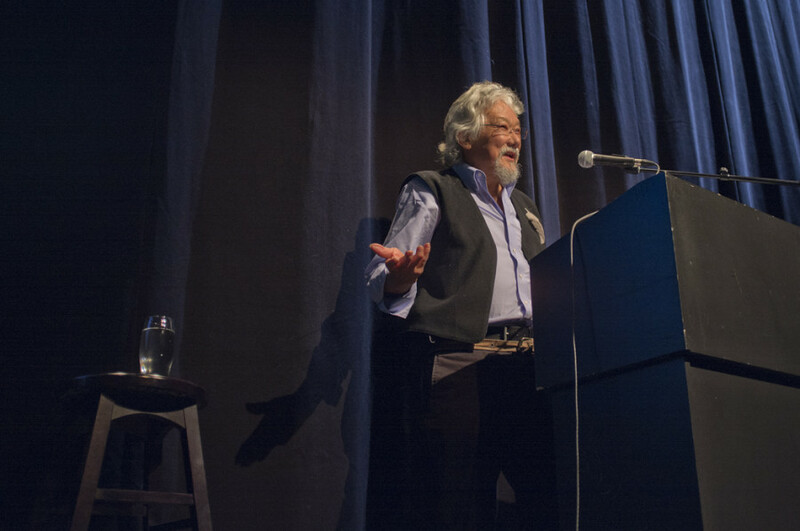 He’s best known as a scientist and environmental activist, but it didn’t take long for David Suzuki to criticize the current economic system before hundreds of Concordia students at the Beyond Business Tomorrow conference in Place des Arts last Saturday night. The Vancouver native told students, many from the John Molson School of Business, that they needed to rethink what they were being taught. “The destructive economic paradigm is perpetuated by the schools feeding it. We’ve got to get some biology in business school,” Suzuki said. Suzuki’s talk, organized as part of the Concordia Student Union’s Speaker Series, was one of several at a conference hosted by the John Molson Sustainable Business Group. The conference was focused on exploring the challenges of industries looking to promote sustainability. Other speakers included the CEO of the Toronto Atmospheric Fund, Julia Langer, as well as sustainability advisors James Temple and Jean-Benoit Fournier. “We’re using up the capital of our legacy and children to feed this economy that is far too large to continue to grow,” said Suzuki. In business, growth is considered to be progress, but more is not always better. A rising population has created a strain on our global resources, according to Suzuki. “We need to move toward a de-growth system right away, it’s the only sure-fire way humanity can survive,” said Suzuki. In biology, carrying capacity is the concept that environments can sustainably support only a certain number of individuals. “Our world has a carrying capacity for humans, and we may have already passed it,” Suzuki explained. In addition, he addressed the fact that many Nobel Prize-winning scientists are speculating that humanity has already passed the point of saving itself, suspecting the end of civilization within a few decades. At Suzuki’s birth in 1936, two billion people lived on Earth. During his lifetime, the global population had more than tripled. In the process, an increasing number of people are moving from small towns to cities, taking their focus off of nature. “Environmentalism has fundamentally failed. We’ve failed to shift the way people see the world,” Suzuki said, adding how many of the endangered resources he protected in the 1980s are today being exploited by businesses. Following the conference, the CSU and the JSG announced that as of May 2015, a scholarship in Suzuki’s name would be awarded to Concordia students with outstanding achievements in ecological science or sustainable business. Over the course of his career, Suzuki fought to raise awareness on the environment and sustainability. Armed with a PhD in zoology from the University of Chicago, he has hosted CBC television show The Nature of Things since the late 1970s. In 1990 Suzuki co-founded the David Suzuki Foundation, which works to conserve the environment. Suzuki was named to the Order of Canada in 1977, becoming a Companion of the Order in 2006. UPDATE: An earlier version of this article stated that the CSU announced the scholarship. The CSU and the John Molson Sustainable Business Group announced it. The Link regrets the error.